The Brian Lawton Legacy project held an Open house event at Southgate Theatre in Honley, near Huddersfield. Approximately thirty-five people attended the afternoon event and enjoyed seeing photographs taken by Brian Lawton in this informal setting. It was an opportunity to share photographs that had already been scanned: visitors could talk to members of the project team, share their own stories, identify images on display and enjoy the photographs that were projected onto a large screen at the front of the theatre. Stephen Dorril, director of Holmfirth Film Festival introduced the occasion and Heather Norris Nicholson, projector co-ordinator and researcher, talked about how the project would take shape over the coming months. The occasion was recorded on camera and in due course we hope to have a short film available about the project. Some photographs of the event are also on the website. Some excellent contacts were established with people from the established folk music communities of West Yorkshire. 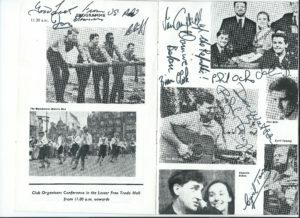 Other people had memories of attending The Singing Jenny folk club, run by Brian Lawton for some years in Huddersfield and we were delighted that some of his former friends were able to attend, including Laurie Stead and Trevor Charnock. 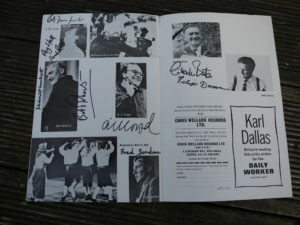 Although the majority of people attending were from the local area, news of the project has already travelled widely and one person had travelled from Surrey to find out more about a collection of signed photographs and music memorabilia that had turned up in a second hand music shop in Guildford. Read more below about this intriguing story as it unfolded during October 2017.